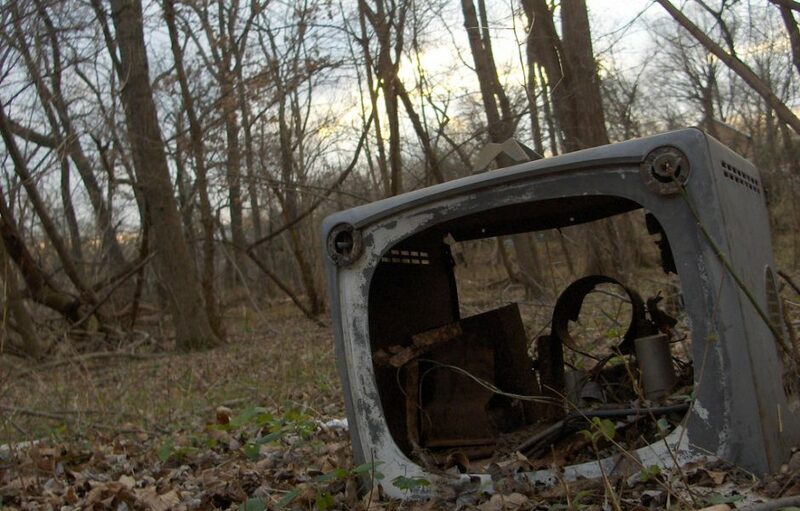 I’ll be honest and admit: I cannot imagine what life would be like with a television. I would have to go back to my pre-teen years to really appreciate what this gadget means, to the days when it was still relatively new and something of a miracle. I even remember, straining my mind slightly, the day we received a colour television: seeing it through the gap in the living room door and noticing that this massive box had grown in size; the black and white versions of earlier years were thinner but, of course, nothing like as slim and pretty as modern versions. But I cut the cable before it was fashionable to say that, and before there even was a cable to cut, before cable television had even be thought of. I think the last time I had one of these glimmer boxes was at the end of the Seventies, in the time that I came back to London from school and before I moved out into my own life, my own apartment, further education and work. Once I was out there on my own – London at the start of the Eighties, and then travelling through to the mid-Nineties – there was no need to own a television, there was real life to be experienced, and the interesting places they showed on the small screen could be visited in person. That was back in the days when there were three, maybe four channels to choose from, but the cultural worth was considerably higher than it is today. And why decide to go through life without a television, without access to all the cultural events and programmes of educational value? I think because they never really inspired me in any way. I could choose between learning about, say, dinosaurs over half an hour on one channel, or going to the National History museum in South Kensington and spending a day looking at skeletons, fossils and everything else that went with the real thing. And, of course, my early distraction from the pressures of life: books. I worked for many years in a book store and spent more time than most with my nose in books, learning. Relaxation was a cup of tea and a book to be read, not like today with a bag of crisps, two beers and the remote in a comfy chair which automatically lifts your feet off the ground to the idea height, and with which you run the risk of falling asleep where you are and missing the programmes any way. Not that I am criticising anyone who decides that television is the life they need in their house, the connection to the outside world, or the hobby which will keep them sane at the end of a working day; we all have our interests and desires, and it is not my place to tell one or another what they should be doing with their lives. Not that this stops other people from telling me – always with my nose in a book, how can I be enjoying life? – but a smile and a nod tends to do it; I’m old enough to know my own way, but not too old to change my ways if it serves a worthwhile purpose. And television, I’m told, has changed since I was a boy, with countless channels available, and more soap operas and reality shows than you can shake a stick at. I still have the Big Brother image of television in my mind, from Orwell’s 1984, where the box is used to watch the citizenry as much as to politically inform them. The telescreen received and transmitted simultaneously. Any sound Winston made, above the level of a very low whisper, would be picked up by it; moreover, so long as he remained within the field of vision which the metal plaque commanded, he could be seen as well as heard. Quite a vision of the modern world, when you consider that it was written in 1949, before such technology was available to the masses. In fact, there are some people today who, when using their computers, ensure that the small camera built into many modern models is covered up, so that infiltrated software can’t turn it on and allow unknown spies and voyeurs to watch. This isn’t really as far-fetched as it may sound, there are so many computers without protection, and so many people who will click on the strangest of links, that an infection is almost a matter of course. I only need to look at the hourly reports from my web sites to see who is trying to do what, and to see that these people trying to gain access to my server are using hacked computers and servers across the entire globe. But I am sure you understand the notion of being under the watchful eye of someone all the time better than most. That said, I do not have any fears of such things; I am not scared that my life will suddenly be revealed, or that agents of a foreign power will storm my house simply because of what I am doing in front of the computer. I’m also not so sure that anyone would want to watch a bearded old man as he writes letters or checks his Twitter account – despite my dislike of some forms of modern technology, I have most things, I just don’t use them all day and every day! – even when I do I usually tend to have my shirt and trousers on. Everything has its uses, and no one can be expected to learn everything there is to learn, or witness the entire world in one lifetime. Today, as an example, I have discovered that a celestial globe featured in a painting by Hans Holbein the Younger – The Ambassadors – is set to 14:40 on 12 July 1533, which is an absolutely useless piece of information normally, but fascinating nonetheless. Added to which an explanation of the painting by the Director of the National Museum, where it is on display, and some of the celestial and astronomical instruments portrayed in the painting my high-ranking members of the Royal Observatory in Greenwich: not things that are easy to come by without a direct connection. Back in the mid-Eighties, when I first began writing letters to all and sundry, it would have been necessary for me to write to several people to get just that information, since I do not have an explanatory catalogue in my library, and that would have taken forever. I can remember writing to the former director of the Victoria and Albert museum, and waiting one or two weeks for an answer I was never guaranteed. That was about women’s underwear, funnily enough, and he did reply: he’d made a comment about how easy it was to see what form of undergarments a woman was wearing in Victorian England, which surprised me as the dresses worn, the entire fashion of these times, tended to be voluptuous and certainly not designed to allow anyone information about what was worn underneath. He gently told me that the undergarments of the times included corsets and the massive cages which pushed dresses out which, clearly, would have been hard to miss. And tomorrow I shall be writing to the French book illustrator Tomi Ungerer about a comment he made in a recent magazine article to a question from a five year old child. Life is full of small things which make it interesting. I have a firm belief, which few have been able to shake so far, that letter writing is there not just for communication, but to inform and, above all, to get people to think. So it is with some pleasure that I read your words, that my first letter gave you cause for thought and, in your most recent missive, that you are deep in thought even in the earliest hours of the morning. Not that I wish to rob anyone of their precious beauty sleep – which neither one of us, at our age, needs in order to preserve our looks – but keeping the grey cells active is, to my way of thinking, a necessity. Without the capability of thought we’d just be vegetables, living a life from one day to the next without hope, without inspiration, without anything worthwhile. And that, I believe, is not worth thinking about. I enjoy the challenge of writing letters to those who are prepared to think, who have an opinion or life experience they will share, who are prepared to debate and discuss with an open mind as much as with an open heart. There are not many such people about: today we all have our partisan beliefs, our political party for life, our religion which cannot be shaken. It is increasingly difficult to find the Thinkers, only those who believe they think, but are following the same straight and narrow path they’ve followed their entire lives, looking neither to the left nor the right, and missing more of life than can be imagined. Debate and discussion is not about proving someone right or wrong, but about allowing people to share their experiences, their understanding and knowledge, their wisdom in an open manner, without fear of retribution. It is what we fondly call Freedom of Speech, Freedom of Opinion which, sadly, applies only for those with the loudest voice, and not necessarily those with the strongest argument or highest level of wisdom. It is also the fact that, with letter writing, you can voice your opinion, air your knowledge, without fear of interruption. The writer is in his or her office, at a street café, in the train or bus travelling, and the reader is elsewhere, unable to hear what is being thought, unable to know what is coming and, therefore, unable to prepare themselves or distract from a line of thought. It is the perfect conversation, because it cannot be broken in mid-sentence. A letter can be re-written, where words spoken are out there immediately, and very difficult to bring back and correct. And a letter can be re-read; it doesn’t just disappear into the air, vanish on the wind as soon as the words have been spoken, it is there, preserved, ready for reference and ready, for some, to be passed down through time to later generations. Of course, letter writing is also a very lonely occupation, but not as lonely as writing a dissertation or a novel where there is no feedback whatsoever. We write hoping for a reply, hoping to find someone prepared to think over our thoughts, and reply with their own which, taken together, allow us to think further. What we would call today, when it works, a win-win situation. I’m keeping some of your questions on hold for a future letter, not that I have any problems finding things to talk about, and certainly not that I have any secrets, but I need to make sure you’re getting what I send since I know that there was a massive rule change in Virginia in April, and that certain security levels are having their post restricted to a maximum page number, and that certain items are no longer allowed in original. I am sure that you appreciate this is not the fault of the mailroom, who have now been given the thankless task of implementing the new rules and regulations without, as I understand it, any enhancement to their numbers, but I don’t want to send something and hear later that it fell victim of a shredder without you being able to cast an eye across it first. I also know that I cannot send you stamps, which would normally have done without a second thought, as these are explicitly banned – unless the mailroom takes them out of an envelope and keeps them as credits, which the information I have does not specify. But electronic correspondence is a conversation killer for me as I am constantly travelling, and sometimes have to break off writing for an hour or two when something else comes up which demands my attention. So I will leave off with a simple question or two: are photographs given to you in original, or does your security level forbid this at the moment? If I send global stamps will they be held in trust for you?